We are in the wonderful process of packing and moving. But here are a few pictures of the house before we moved some of our belongings in. The house has great bones, but needs a face lift here and there. First, there’s the kitchen… Someone took an exorbitant amount of time to sponge-paint the trim on all the cabinets and backsplash. I spent a lot of time wiping out each cabinet and pulling out hordes of floral contact paper. Here is the back half of the kitchen. There isn’t a laundry area, so for the time being, we’ll have to put our washer and dryer in kitchen. We’ll eventually move it to the upstairs bathroom, but for now, our clothes will smell like bacon. And let’s be honest, we cook a lot of bacon. If you’re not cooking bacon more than three times a week, you’re not doing life right. This is the downstairs bathroom, it features baby blue tiling with fancy seashell stickers and ornate floral wallpaper. Side note, we discovered very quickly that there isn’t a vent in this bathroom and the potty smells of said bathroom waft ever so delicately right to the dining room. YUM. (another reason to cook more bacon). 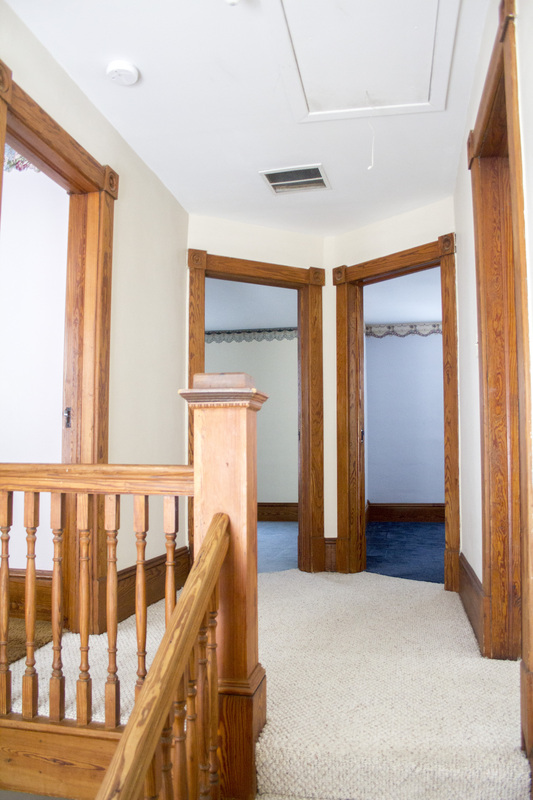 This is the upstairs hallway. I can’t stand that each room and the hallway have different colored carpet, but the carpet is in almost excellent condition and is really high quality. It cleaned up really nicely after we shampooed it. Matching carpet will be a project many years down the road. I wish we could have replaced it prior to moving it, but alas, it didn’t fit into our budget. The above picture is Linc’s room. All the borders are coming down this weekend. I’m thinking about painting Linc’s room this color. I feel like it’s a more sophisticated version of the color of his current room (I sound like a total yuppie). Here is our bedroom. We’re not sure why all the closet doors are off. We think because they don’t shut because of the carpet? I’m sure we’ll find out. Here is an awkwardly put-together panorama of the upstairs bathroom. It used to be another bedroom but was converted into a bathroom. When we first toured the house, the family told us there used to be a claw-foot tub in there. Now it’s a tiny shower with lots of twirling room in the corner. This is where we’ll hopefully move laundry one day and get that claw-foot tub back in there! We’ve had all but termite inspections done on our current home, which the buyers will close on March 31st. We’re in the process of packing up our current home and sending the call signal out to our friends and family to help us move. Stay tuned for a post showing the outside of our house and land. So far, the most exciting thing we’ve discovered on our property was a fairly large, frozen, dead snapping turtle in the creek behind the house. Chris tried to move it. I yelled at him that he would get bird flu if he touched it and why did he want to move it? Chris yelled back that he was going to hang it from something. And then that’s when we discovered that it was frozen into the mud and wouldn’t budge. Ah, farm life.